Our company has been a leading service provider when it comes to repairing garage door systems, but did you know that we offer similar services to automatic and manual gates as well? Both residential and commercial system owners can benefit from what we have to offer. Much like the average garage door, your gate can greatly benefit from regular maintenance. Our technicians will examine all of its moving parts, including the hinges and wheels, and lubricate all the relevant components that can gain a boost to their performance by it. We'll also make sure your opener and all of its interior components, such as the motor and the circuit board, remain fully operational and aren't compromised somehow. Let's pretend that you have a beautiful looking wrought iron gate that you take great care of and make sure to regularly clean and maintain. Maybe its the distinguished face of your business, or the majestic entrance to your home. Now let's pretend someone accidentally damages it with their car. You'll be crestfallen, for sure. But we're happy to tell you that not all is lost. 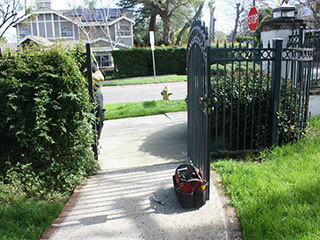 Our technicians can weld everything back together and restore the prestigious appearance of your gate. Sometimes, problems can occur inexplicably, without a clear reason why. Our technicians are experts at troubleshooting and discovering underlying issues quickly. Whether if its a worn out motor gear or some electrical wire that's started to misbehave, you can count on our team to provide you with an effective solution. If you're looking to get a new system installed at your home or place of business, then our experts will gladly consult you on the various options you have available. From swing and sliding gates that can look very prestigious to rolling gates that have more of an industrial appearance. Call our team at Garage Door Repair Elmhurst to get the best service around.